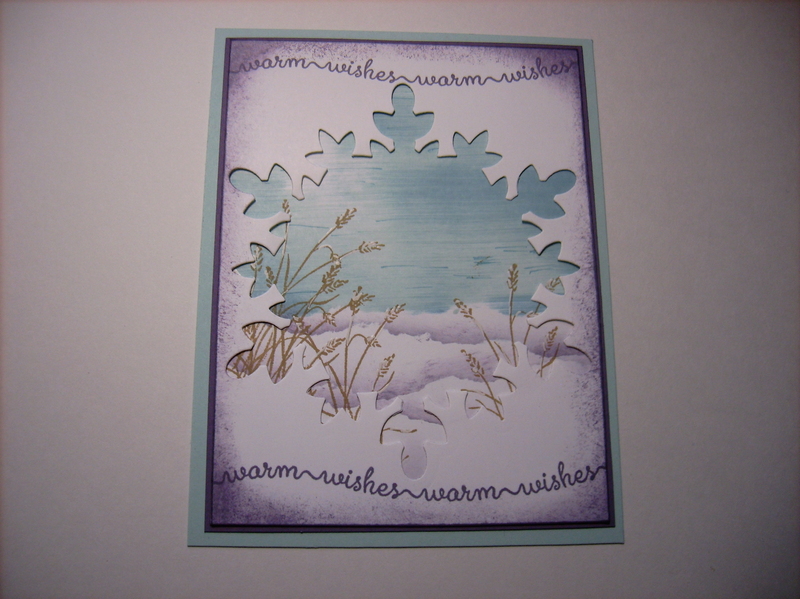 Today’s card is a Stampin Up My Digital Studio card that I created in a snap using the basic tools in MDS. 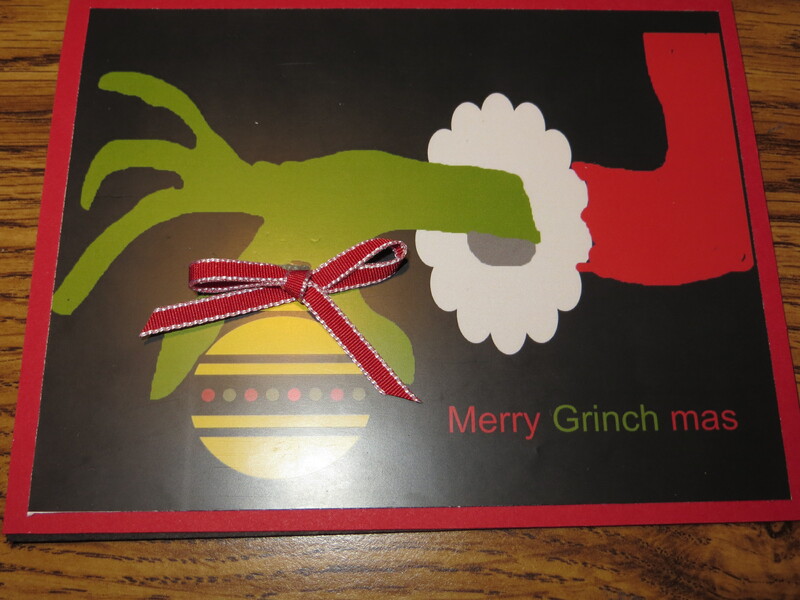 I freehanded the Grinch’s fingers and added a brush stamp ornament that I colored. Once I was done I printed them at Staples and then mounted it on cardstock and added a piece of ribbon to make it a hybrid card. Speaking of MDS, remember today is digital download day at Stampin Up so be sure to check out the newest downloads for MDS available on the Stampin Up site. The picture does not do this card justice. I must say that I am really lucky to have Cammie as not only my sister but my Stampin Up upline because I was lucky enough to receive all 7 of her brayered Christmas cards this year. This card ranks right up near the top of my favorites. I loved it so much that went ahead and ordered the Snow Day stamp set so that I can recreate this card for some winter birthdays and keep my brayering skills fresh!!! 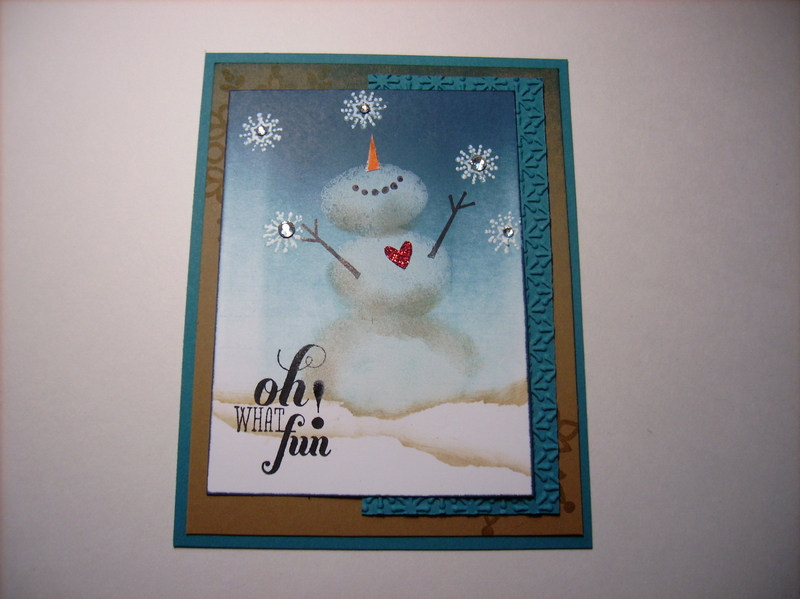 Cammie brayered the background and added the snowman from the Snow Day stampset #131895 from the Stampin Up holiday catalog and added the sentiment from the Christmas Messages #131793 stampset also from the holiday catalog. She randomly stamped snowflakes from the snow day set and added rhinestone bling to the centers. Oh what fun it was for me to get this card! If you still need to order from the Holiday catalog it’s not too late you can order from it through January 2, 2014 so don’t miss out. Words cannot describe this beautiful card we made in Cammie’s brayed workshop. When I saw it I thought there was no way that I could ever make this card and believe it or not we all completed them and were happy with the finished card. I will not go into the specific how to details of this card but it included brayering, sponging, masking, and embossing. 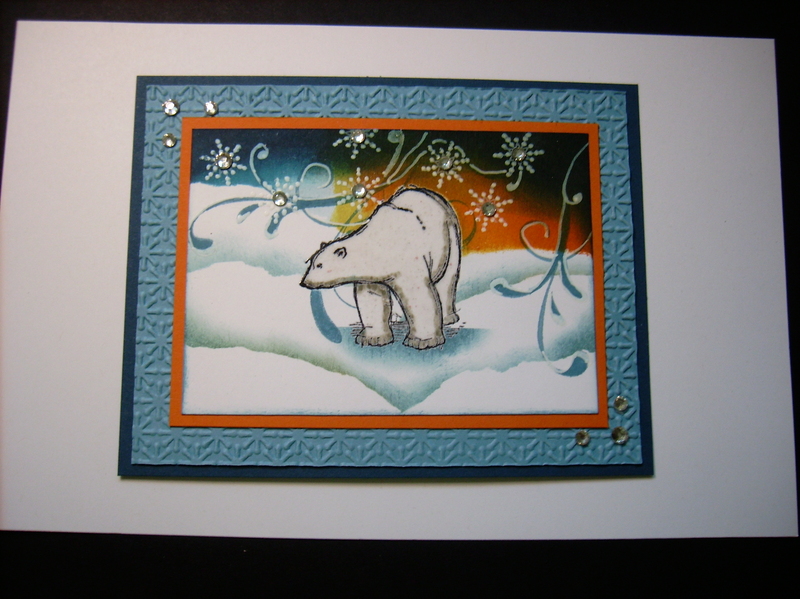 We used the Zoo Review #122199 stampset for the adorable polar bear and the Everything Eleanor #124164 stampset for the flourishes. After creating the panel we added it to a marina mist textured layer with petals a plenty folder #116824 and then on an Island Indigo Card base layer. Simply stunning results that has moved the Zoo Review to my wish list. Today’s post is the final of my same layout different look cards. Both cards are simple in design and work well when you need a bunch of the same design. 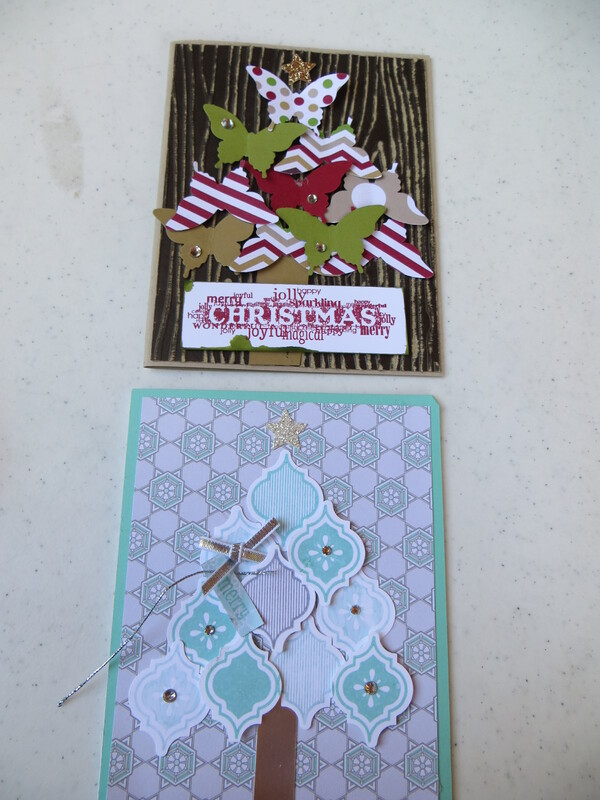 Top card uses the Season of Style DSP paper pack#132181 from the Stampin Up holiday catalog. The sentiment is a retired Christmas sentiment that is cut out from the Labels Collection framelits #125598. The bottom card uses the Winter Frost DSP paper stack#132183 and all of the snowflakes from the Festive Flurry #131781 stampset and the coordinating Festive Flurry Framelits #132193. After stamping them in shades of inks and cutting them with the framelits, I stacked them to create a beautiful layered snowflake. In Whoville they say – that the Grinch’s small heart grew three sizes that day. 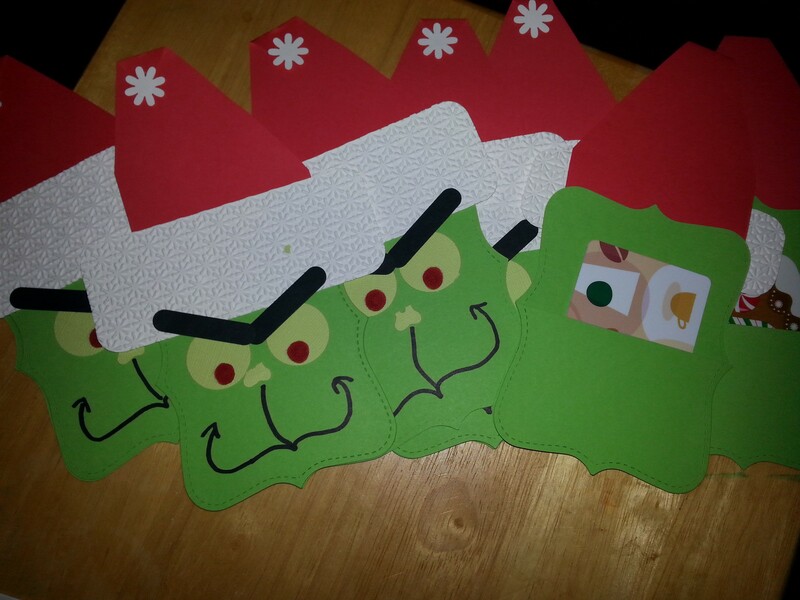 And then – the true meaning of Christmas came through, and the Grinch found the strength of *ten* Grinches, plus two and so did Blair when she made these adorable Grinch giftcard holders for her corpsmen. They loved them so much that they have them hanging in their workspace. But then again who does not love the Grinch? 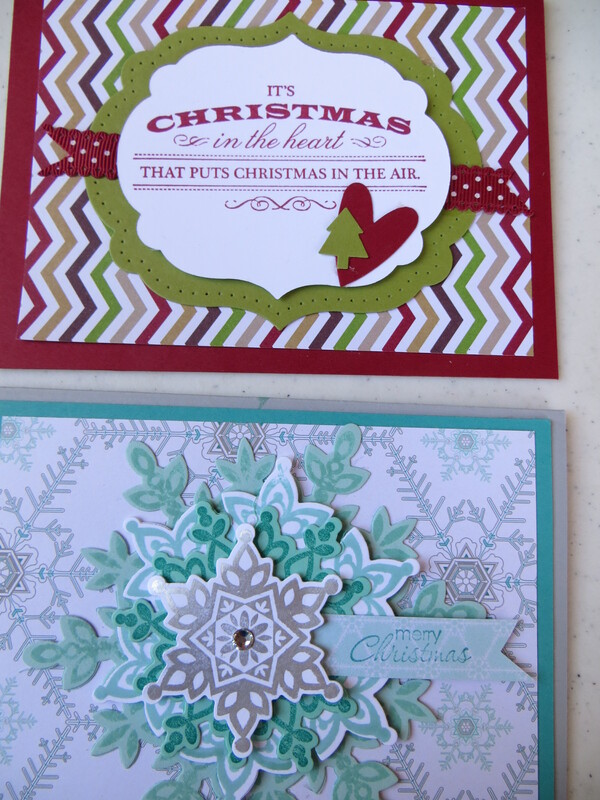 Blair made these using her favorite Big Shot die – the top note#113463. She used Circles for the eyes and the beloved word window punch #119857 for the brows. She textured the brim of his hat with the petals a plenty folder #116824 and hand drew his face. She added a pocket on the backside using 1/2 a top note to tuck the gift card in. Since it is Christmas I am posting a 3rd post for the day. This post is another of my same layout different look card. I made trees for both cards. The top card the tree is made using the Elegant Butterfly punch #127526 and the Seasons of Style DSP paper pack #132181. For the background I textured the espresso Core’dinations cardstock #129956 and using the woodgrain textured folder #127821.